Fictional baseball manager Jimmy Dugan is all over today's sports pages. 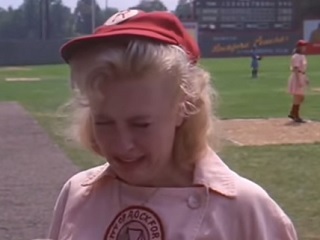 No matter what hacks who quote A League of Their Own say, there’s no shame in crying in baseball. Jimmy Dugan… The tweet floor is yours. And kudos to SportsNet New York editorial producer Andrew Vazzano for the hilarious tweet he sent out last night. Truman is indeed still a U.S. president, and Carlos Gomez still a Milwaukee Buc Brewer. Is Twitter to Blame for an MLB Player Crying on Live TV During a Game?